After our previous post have we left you still wondering which one is best for you, the Blue Cat’s MB-7 Mixer or the Blue Cat’s PatchWork? Maybe the answer is get both. In the previous post we explained the differences between them especially in regard to the VST hosting features that they share. So if you are still hesitating, maybe its because you need both? 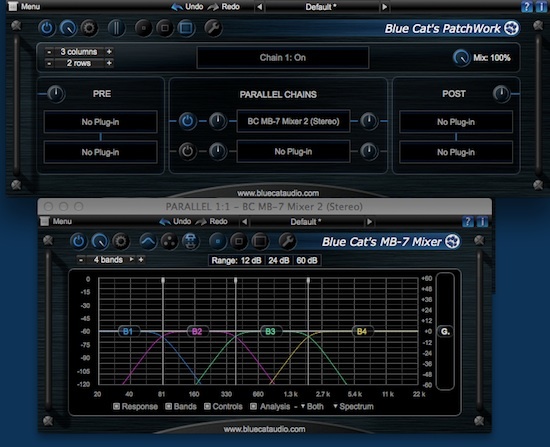 If you need parallel processing or an individual “Mix” control for each plug-in within your multi band setup, you can simply use Blue Cat’s PatchWork inside one or more bands of Blue Cat’s MB-7 Mixer, and here you go: multi band VST processing with parallel chains and dry/wet control! Since windows layout is kept and restored when closing/opening Blue Cat’s MB-7 Mixer, the inserted PatchWorks are just an extension of the MB-7 Mixer’s plug-in slots. On the other hand, you may also want to use Blue Cat’s MB-7 Mixer within Blue Cat’s PatchWork to apply spectral effects as part of a more complex chain. 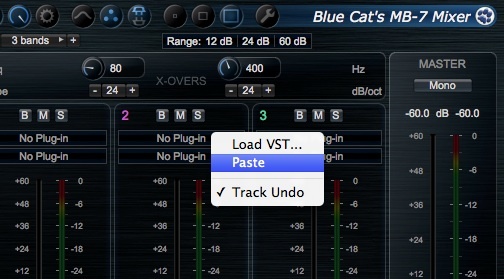 Also, if you are missing PRE and POST spectrum splitting effects in Blue Cat’s MB-7 Mixer, you can get them easily with such a mixed configuration! In addition to be able to instantiate one into another, both plug-ins can also co-operate: for example, you can copy or transfer a plug-in and its settings from one to the other. So it’s pretty easy to switch from one plug-in to the other (if you don’t have hundreds of plug-ins in there of course…): you can transfer effects chains from one plug-in to the other with just a few clicks! 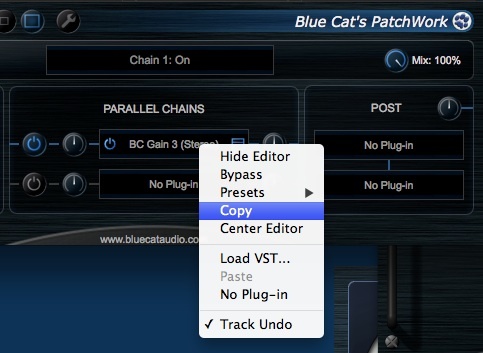 And best of all, it also works if both plug-ins are hosted in different applications, in different plug-ins formats! Try it for yourself check out the demos!